Innovative water treatment solutions have been the heart of EasyWater since its founding, and it all began with a challenge. EasyWater was founded in 1986 by Bill Freije, a Purdue University Mechanical Engineering graduate and registered professional engineer. Bill had many years of experience designing and constructing plumbing, HVAC and industrial refrigeration systems in a family-owned construction business prior to starting EasyWater. In the mid 1980s, Bill was approached by a friend from college with a problem. His friend, a plant engineer, was working at a manufacturing facility that had been cited for discharging chemicals from cooling tower blowdown into a stream behind the plant, and he wanted to know if Bill knew of a way to prevent scale build-up without using chemicals. He told him he didn’t, but his friend — desperate for a solution — kept asking. Soon, what began as an attempt to help a friend became a lifelong passion for treating water more effectively while reducing pollution and saving water and energy, leading to the creation of EasyWater in 1986. These solutions are benefiting engineering firms, end users, energy performance contractors and our environment in a significant way. Each of these solutions is designed to provide more effective results, while reducing energy consumption, water waste, maintenance and chemicals. Several of these solutions have proven to be so effective that they quickly pay for themselves from the energy savings alone. EasyWater is a privately held business that greatly values people and believes that each person is unique and should be honored and respected. 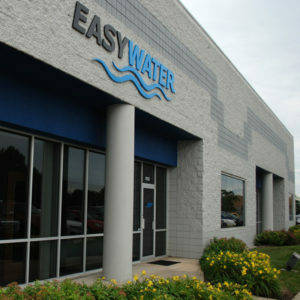 As a company, EasyWater values integrity and honesty, and is fanatical about serving their customers. EasyWater donates a portion of its profits to help people in need, which includes providing clean drinking water. Find out how we can help you solve your commercial water treatment problems by contacting us today at 1-888-766-7258, or by filling out our free estimate form below.